Talk of visiting a distillery in an old mill in the Netherlands had my mind conjuring images of sails turning slowly on a windmill. The Graanbranderij De Ijsvogel is, however, located within a water-powered mill at Arcen in the Dutch province of Limburg, just a couple of kilometres from the border with Germany. 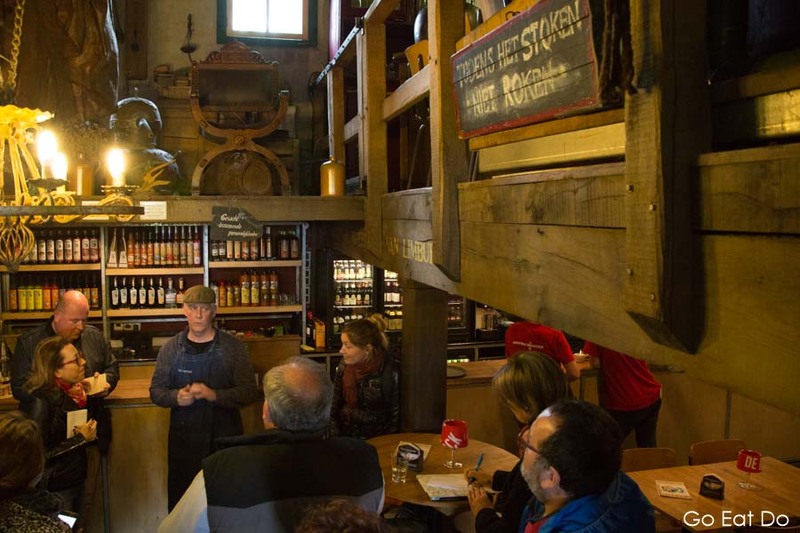 Disclosure: Stuart visited the Arcen watermill during a group tour organised by Visit Limburg. Neither Graanbranderij De Ijsvogel nor Visit Limburg reviewed or approved this post. A typical Dutch mill? The watermill at ARcen that houses the De Ijsvogel Distillery. The distillery is named after the kingfisher, a bird that was rarely seen on the waterways of Limburg in 1993, when De Ijsvogel opened. These days, though, the colourful birds can be spotted frequently, sitting on overhanging branches and darting into streams while hunting prey. The company logo depicts a kingfisher perched on a branch. More than 60 different types of spirits and liqueurs are produced in the distillery, including genever — the spirit that inspired the English to make gin — herb-based bitters with medicinal-like flavours and a version of whisky. Yes, Dutch whisky. It spends three years ageing in bourbon barrels and one in old port barrels. In fact, it’s now a tradition for the mill to host a festival on the first Sunday of October during which the new batch of four-year-old whisky is presented. A shot or two in the barrel? Spirits maturing at De Ijsvogel Distillery. A mill has stood near the place where spirits are now distilled for centuries. In 1677 a new watermill built, at the current site, on the orders of the Dukes of Arcen whose castle is a short walk from the mill. It remained in use, milling grain and squeezing oil from flax seeds until 1928. The ravages of time and impact of Allied munitions during World War Two left the mill in a state of ruin until the 1980s, when restoration work began. It wasn’t until 27 May 1993 that the restored mill reopened, replete with its distillery. I was welcomed in by Pieter, the proprietor of the distillery, who asked me to follow him up a steep wooden staircase before explaining how he distils strong alcohol from beer. His father-in-law was formerly the owner of the nearby Hertog Jan brewery, whose seasonal beers are still produced in Arcen. Beer, with a strength of around eight per cent alcohol by volume, is heated in kettles with a capacity of 400 litres. It’s distilled twice to create a powerful spirit. Pieter introduces one of his distilling kettles. To discover more about how flavours are added to his drinks, Pieter bade me to follow him into the attic. That meant climbing up a narrow flight of wood more akin to a ladder than a regular staircase. A 10-litre glass demijohn filled with alcohol and asparagus peelings stood on a long wooden table that was sagging in the middle, despite looking heftily made. Perhaps the cumulative effect of the weight of demijohns over the past quarter of a century? Pieter explained that asparagus peelings are collected from local restaurants then soaked with other ingredients for a year. Seven litres of strong, aromatic alcohol is decanted from each demijohn, providing the basis for 25 litres of liqueur with an alcohol content of 25 per cent by volume. Asparagus in the jar. Peelings give flavour to the alcohol in the demijohn. Each year, De Ijsvogel produces 5,000 bottles of asparagus liqueur. The novelty drink is made from one of the region’s most celebrated agricultural products. The sandy soil of Limburg is ideal for growing asparagus. Farms from the region deliver their harvests to Venlo, where the so-called ‘white gold’ is auctioned from April into late-June. The asparagus liqueur made a favourable impression on those who tasted it. Priced at €15 a bottle you might even say that De Ijsvogel is transmuting white gold into liquid gold. The bar on the ground floor of the watermill in Arcen, the Netherlands. The Graanbranderij De Ijsvogel (Schans 20a, 5944 AG Arcen; tel. +31 77 473 1240) can be visited for a guided tour of the mill and distillery, including a product tasting featuring three of the drinks. See De Ijsvogel’s website for information about opening times and prices. The mill has cosy, old-fashioned bar on its ground floor and terrace seating. It’s well-placed for refreshments, or perhaps something to dull the pain, after cycling along one of the trails that run through the nearby De Maasduinen National Park. The cycling trails run for between 25 and 40 kilometres. A 12-kilometre footpath is also a way of exploring the dunes of the national park. Find out more about the surrounding region on the Visit Limburg and Visit Holland websites. Stuart Forster, the author of this post, can be commissioned to write food and travel features about the Netherlands. He was named Journalist of the Year at the Holland Press Awards of 2015 and 2016, and presented with the Digital Influencer of the Year award at the 2018 ceremony. Illustrating photos are by Why Eye Photography. Why Eye Photography is available for food, travel and portrait photography commissions. I love the idea of visiting this mill and a tasting session. This is quite the experience! I would like to try this drink.